There are plenty of people who know what to do but can't pull it off. They have the book knowledge and then stumble when it comes time to implement the ideas. And I want to emphasize this - - I'm talking about building and leading HIGH PERFORMING teams. The world is filled with mediocre, average and run-of-the-mill teams. Poor implementation produces poor (or average) teams. To build and lead a high performing team you must have a "force of will" that will carry you through the tough times (and there WILL be tough times). Another name for "force of will" is ATTITUDE. To build a high performing team you must show up with a different attitude (different compared to what you'll find from leaders of mediocre teams). I recently interviewed Robyn Benincasa who is an expert when it comes to having the right attitude for both leading and being a member of a high performing team. Robyn is a firefighter in California and she is a professional adventure racer. 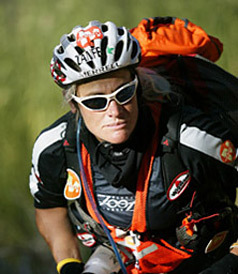 During the interview we focused on the lessons she's learned about teamwork through her exploits in adventure racing. Robyn has completed six Ironman races, with two podium finishes in her age group in Kona, Hawaii. In the past 10 years, she has completed over thirteen “expedition length” adventure races (7-10 days, non stop), and has earned World Champion honors in both the Eco-Challenge (Borneo, 2000) and the Raid Gauloises (1998). In addition to her work as a full time firefighter, Robyn runs a training and development business called World Class Teams and is a sought after motivational speaker. Our interview focused on one of her most popular keynote speeches entitled “8 Essential Elements of Human Synergy”. To access the recording of this informative 60 minute TeleSeminar login to the Members Only Area of the IATF. Not a member? CLICK HERE to join. Are you ready to become the ULTIMATE TEAMBUILDER? Check out the new virtual leadership development program Leader As Coach Fast Track Program. Over the course of this engaging 10-week program you'll make the shift from a traditional (command and control) model of leadership to a more powerful model of leadership based on a "coach approach". Does it work? YES! And we're so confident in the results you'll experience that we offer a powerful guarantee. CLICK HERE for details.